Chalmers writes, ‘there can be no doubt that the interpretation and evaluation of [Angus'] work has suffered because of the obscurity surrounding her life and character.’ Despite the obstacles that she – indeed any woman poet of that time – faced as a marginalised writer whose contributions to the literary renaissance were as a matter of course minimised, Angus’ work was highly regarded by a number of contemporary writers. MacDiarmid – and others – did recognise, but not entirely unequivocally, her important contribution to vernacular poetry. 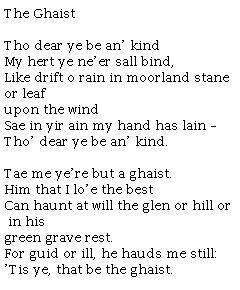 And one wonders to what extent MacDiarmid’s own early lyrics were influenced by hers. The fact he considered the lyric as a vehicle worthy of himself must surely pay some kind of compliment to Angus. The process to reverse the neglect that her work has suffered in the past fifty years requires more than simply reissuing her poems; in mathematical parlance, this measure is necessary but not sufficient. As important as it is to make her poems available again, even more so is the need to present a revaluation of her work. While in recent years others have devoted attention to Marion Angus that has been instrumental in the revival of critical interest in her work, Chalmers’ monograph brings it back into public view and places it in its proper context. 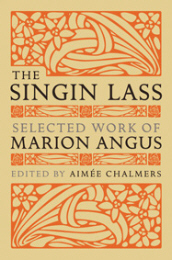 Now sixty years since the death of Marion Angus, nothing could be more timely than the publication of this volume which, in addition to almost one hundred poems, in Scots and English, includes short extracts from her prose and her letters, with Aimée Chalmers’ substantial biographical and critical essay giving the first overview of her life and work. Where the work of Marion Angus is concerned, too many editors of anthologies of twentieth century Scottish poetry have taken the tried and tested option of including her ‘Alas! Poor Queen’ as the most representative example of her poetry. (And some persist in doing so.) This is necessarily at the expense of many of her other equally fine poems. But it is a particularly fine poem. The critics seem to think so too, and this in turn may have helped confirm the prejudices of the anthology editors. Kurt Wittig described Angus’ portrayal of Mary Queen of Scots as having ‘a modern sharpness’ not unlike Eliot’s ‘Portrait of a Lady’. Rory Watson suggests that this poem ‘might have been constructed by a young Ezra Pound.’ Of all the poems about Mary Queen of Scots, Colm Toibin regards ‘Alas! Poor Queen’ as the ‘best written’. In a recent letter to Aimée Chalmers, Kathleen Jamie wrote, ‘[Angus] has an authentic voice, straight out of the ballad tradition, an eerie shimmer to her best poems and her limitations are interesting – the recurring young lassie figure, for example reveals a halt on her own emotional and sexual development – these have great feminist and Scottish interest.’ But the last word, for the moment, must go to Aimée Chalmers: ‘the subtle strength of Marion Angus’ finest poems earns her work an assured place in any account of modern Scottish poetry… in many of her poems, there is something unexpected… or wistful… that startles for a moment… and makes the reader wonder whether they have missed something.’ This capacity to make the reader startle and read again is the subtle strength of her finest work.